We began to appreciate everything in Heaven. We saw a huge tree, the Bible describes this tree as the "Tree of Life." (Revelation 2:7) We went to a river, and saw a lot of fish inside. Everything was so amazing that my friends and I decided to go inside the water. We began to swim under that water. We saw the fish moving around and they caressed our bodies. They didn't swim away as normally happens on Earth; the presence of the Lord calmed the fish. The fish could trust us because they knew that we were not going to harm them. I was so blessed and marveled that I grabbed one of the fish and took it out of the water. What was so amazing was that the fish was very quiet enjoying the presence of the Lord even in my hands. I put the fish back into the water. I could see in the distance that there were white horses in Heaven, as it is written in the word of God in Revelation 19:11. "Then I saw heaven open and a white horse appeared. 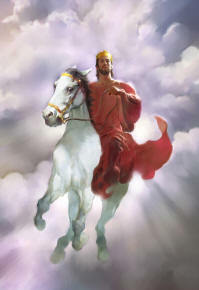 Its rider is called Faithful and True; justly He Judges and wages war." Those horses were the ones that the Lord will use when He comes to the Earth to take His people, His church. I walked to the horses and began to pat them. The Lord followed me and allowed me to ride one of them. 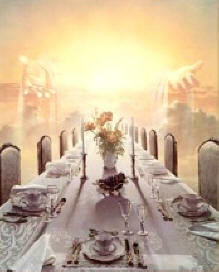 Angels where there with some white cloth for the cloaks that the Lord is preparing for us. I was amazed looking at all these things. The Word of God tells us that we have to receive that Kingdom of God like little children. (Mathew 18:3) When we were in Heaven we were like children. We started to enjoy everything there; the flowers, the residences... the Lord even allowed us to go inside the residences. Then God took us to a place that had many children. The Lord was in the middle of them and He started to play with them. He made sure to spend enough time with each of them and He enjoyed being with them. We got close to the Lord and asked Him, "Lord are these children the ones who are going to be born on Earth?". The Lord answered, "No, these children are the ones who were aborted on the Earth". Upon hearing that, I felt something inside of me that made me shake. I remembered something I had done in the past, when I did not know the Lord. At that time, I was in a relationship with a woman and she got pregnant. When she told me she was pregnant, I did not know what to do so I asked her for some time to make a decision. Time passed and when I went to her to tell my decision, it was already too late because she already had an abortion. That marked my life. Even after I accepted the Lord in my heart, that abortion was something that I could not forgive myself of. But God did something that day, He allowed me to enter that place and told me, "Ariel, do you see that girl that is there? That girl is your daughter." When He told me that, I saw the girl, I felt the wound, I had in my soul for such long time, started to heal. The Lord allowed me to walk close to her and she got close to me. I took her in my hands and saw her eyes. One word I heard from her lips, "Daddy". I understood and I felt that God had mercy on me and had forgiven me, but I had to learn to forgive myself.